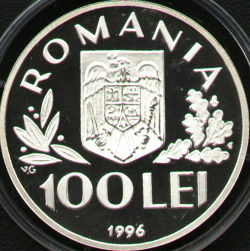 Obverse: ROMANIA, the Romanian coat of arms, at left a laurel branch, at right an oak branch, denomination "100 LEI", year 1996. Below the left laurel branch lies V.G. standing for Vasile Gabor, the engraver's name. 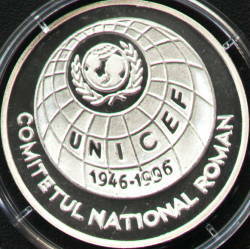 Reverse: graphics of the Earth globe with the UNICEF ensign, the years 1946 - 1996 and the acronym UNICEF, and a circular inscription "COMITETUL NATIONAL ROMAN" meaning "ROMANIAN NATIONAL COMMITTEE"
UNICEF is an acronym for United Nations International Children's Emergency Fund. From 1953 the official name of the organization was changed to United Nations Children's Fund, but the acronym remains the old one.